daily dose of spazz: Makes me Wish for Warmer Days! Makes me Wish for Warmer Days! Looking at this Layout totally makes me dream of warmer weather. I yearn for the day I can tell the kid..."Go outside, you're making me nuts!" And we are so lucky we live across the street from the public park. A playground, field house, ativities...all across the street. Max thinks it's HIS park. The other kids are just lucky he lets them use it really. He walks around the playground as though he is the mayor, waving politely and kissing babies. In August 2006, yes during wonderful weather, they closed the playground to remodel it. I figured they were trying to get it done before the end of the year. They didn't re-open that park until June of 2007! It was a long fall and spring, let me tell you. Then one warm June day, the protective fence was down and I can't tell you how fast the kid ran over to that park, you would've thought they were giving away money over on the slide. He had to be the first to check it out, swing on the swings, attempt the monkeybars. Then report back his complete Ebert-like review. These pictures were taken on that first day of the new park. The paper is very old Fancy Pants that has been in my stash of crap for a very long time. But now that we are doing weekly challenges, I am hoping to use up a lot of the stuff that has, up until now, just been taking up room. 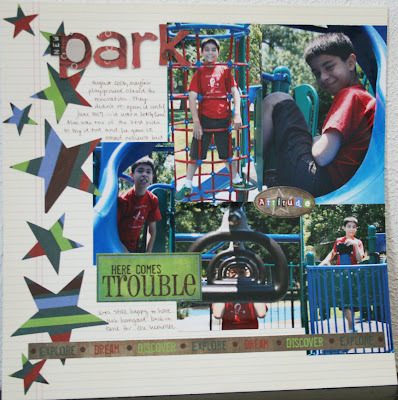 This page was originally entered for a multi-photo challenge over at ScrapDiner! It looks wonderful...the page AND the park. I love the wonderful expresions on your sons face. He's always a hoot to look at. I LOVE this LO...love the stars wespecially. Great photos, too! i'm sorry if i offended you about the volunteer thing...things on my end though, it's been over a week since i've heard anything from anyone and he's missing practice. i know what you mean about them making you feel bad if you don't volunteer. i know it's the same way here. but you'd think, out of all of them on the board, etc., that one of them could return a phone call. love the layouts! when do we get to see another video? What a GREAT layout of Max & the park!...I will say, that the color in the pictures are sooooo vivid and crisp!...are they like that IRL too? and I love how you have grouped th ephotos all together...leaving a great spot for your journaling!...gonna have to pull out my pictures of the park!....oh...and YES....when is your next video??? just think...in a coupla weeks y'all will be down here where today it is gorgeous and in the 60's with the sun shining. Warmer days, that would be nice. I remember neigborhood parks. I used to have to walk through one on the way to school when I lived in the city. I love the colors and layout. I love your layout Simone and the stars are a perfect embellishment! I love, love, love, this LO!!! I got some scrappin done, since I am home AGAIN today! I can't wait till this winter is OVER!